Jin, I want to personally thank you for guiding both me and my parents through this process. As a first time homebuyer, I could not have asked for a more patient, understanding, and friendly agent. Even though our transaction was not the most conventional, I really appreciated your thoroughness and thoughtfulness towards our well-being. It was truly an amazing experience for me; one that I will never forget. After the double digit number of houses we visited, with your help, I believe we chose the best one. Also, thank you for the Home Depot gift card; I plan on using it towards a couple of upgrades for the place. I will be sure to refer you to my friends when they start looking to move. You are always welcome to stop by and visit the place (it's not completely finished, but getting there). Please keep in touch, and let me know if there is anything you need. I feel very lucky to have met Jin Ro. My son was interested in buying a home, but had so little time, so I began looking online in order to help him. Jin's information came up so I decided to give him a call. While talking with him, he was so attentive and interested in what I had to say. I didn't feel at all pressured and I knew he would be someone with whom my son would also be comfortable. Buying a home can be stressful and Jin made this process go so smoothly. He was always eager and willing to show properties in which my son was interested. Jin also demonstrated a wealth of knowledge which I believe, along with his personality, helped my son secure the home he desired with the best rate possible. Thanks, Jin. Jin helped us get our house for my wife and I. We purchased a condo in July 2012. He was super helpful, always there to answer any questions, and gave good advice. I would definitely recommend him. I definitely recommend Jin to anyone who is looking to buy any kind of house or condo. He is the most helpful agent my husband and I have met. Yes, we have met a couple. We actually took a while to make the final purchase and he never pressured us to hurry up. He was always very helpful and honest in answering any of my questions as a first time home buyer. Overall, Jin is a great person to work with. I would definitely recommend him. Jin was very honest and helpful in our decision to buy our first home. No doubt I will recommend him to anyone looking to make a new purchase. 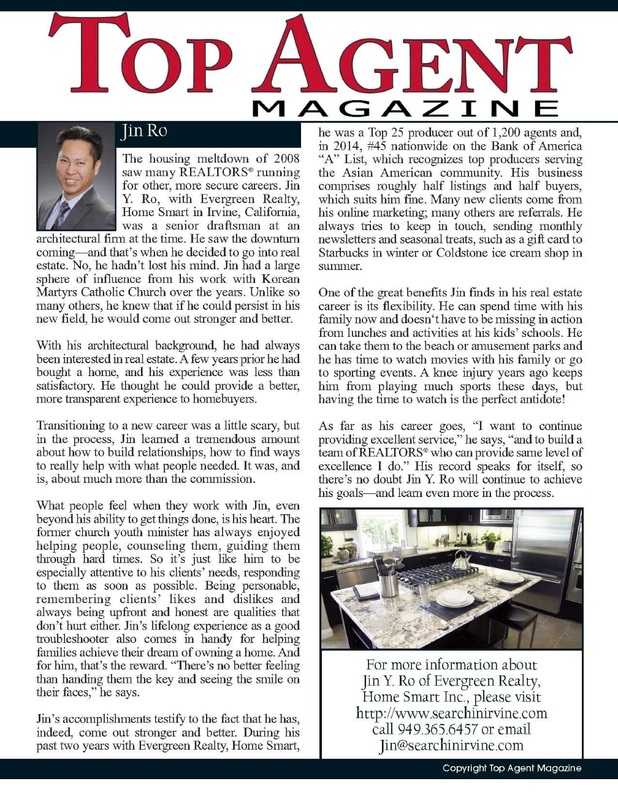 Jin is a rare find in the real estate world. He is truly on your side. He looks out for your best interests and a consummate professional. He is in constant touch with you and promptly responds to your questions and emails. He is very patient and explains everything to you. I appreciate all of his effort! Jin helped us find a wonderful Condo for my wife and I. He was very patient with us through out the home buying process and was always available to show us homes that recently became available. He was great throughout the whole process and I would recommend him to anyone that is looking for a new home! 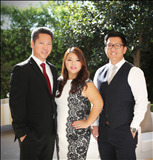 Jin was responsible for the sale of my home in Rancho Santa Margarita, CA. I had previously attempted twice to sell [unsuccessfully], I had minimal equity. Jin was able to successfully market my home, secure a full price + buyer, close the deal and handle my downsize purchase as well. Jin was an excellent real estate expert and I would highly recommend his services. Mr. Ro has to be one of the best realtors in the business. He went above and beyond the job to help secure a property I purchased. He is someone who can be trusted which is hard to find in the business world. I appreciated his advice when he felt a property was out of a comfortable price range for me or had issues that made a property an unwise purchase. He is consistent and does not rush his buyers. I would highly recommend Jin to anyone who is buying a home. He is very knowledgeable about the area and can answer all your questions. He was very patient with us and always took the time to show us properties even though he was busy. He always gave us good advice and took the time to thoroughly research for properties he knew we would like. He really made us feel comfortable and never pressured us into anything. He genuinely cared and wasnt all about making that commission. Also, he is really a nice guy and you get that impression the first time you meet him!!! I highly recommend him to anyone!! Because of him, we found the perfect home for our family!!! Thanks Jin! !